This week has been crazy. Today's shopping post is actually from last Saturday because that was the last time I made it to the grocery store. I am really hoping to make it to the store this weekend but for now at least we still have our staples of yogurt, almond milk, and veggies. This week's produce share was full of great fruits and veggies and we have had a fun time trying to cook outside of our comfort zone and use what we get every other week. 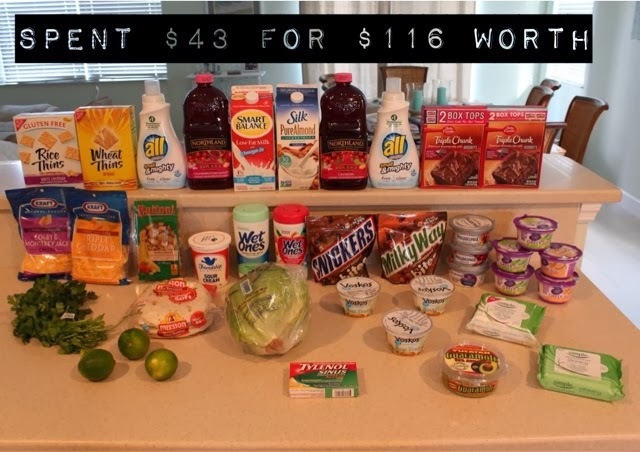 After some discussion, Justin and I decided that we want to make our bi-weekly share part of our regular grocery budget of $80 a week or $160 every pay day. That is for all grocery and household shopping including toiletries and paper products and while we might be a little tight at first with the $45 every other week for the share. I think it is way worth it and so I will just have to plan my shopping accordingly and rely on my stockpile in weeks when the budget gets spent too quickly. Luckily we have had some Publix gift cards lately which really helps since I can then save our weekly cash for reserve money when other weeks get tight. We are picking up our forty pound Zaycon chicken order tomorrow so our fridge and freezer and going to be very fresh and full. Saturday's Publix trip was a pretty standard one. Can you tell by what we got that we had friends over for chicken tacos? I saved about 60% which is always my goal. Justin was with me which made doing two transactions and using two $5/$30 Winn Dixie coupons a lot easier too. Used a $1 off printable coupon from completing a survey emailed to me by man.